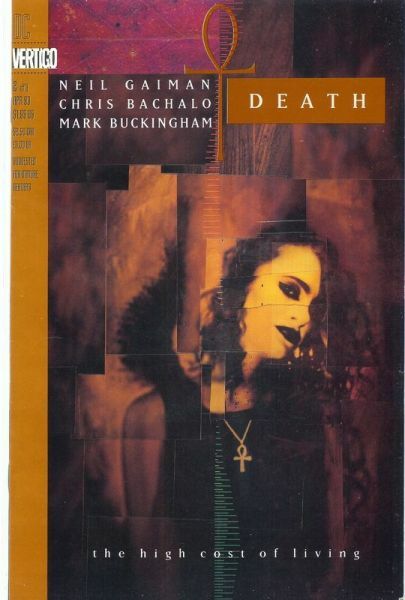 Death: the high cost of living is a 3 part mini-series starring Death, sister of Sandman (aka Dream) and one of the seven Endless. Written by the amazing Neil Gaiman in 1993, it follows a day in the life of DC Comic’s version of the Grim Reaper, who once every century takes the form of a human girl to give her role as a taker of souls perspective and keep her in touch with humanity. 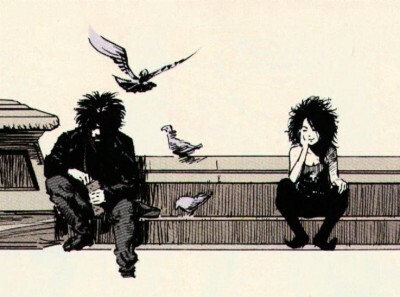 The Endless version of Death was created by Neil Gaiman and Michael Dringenberg in 1989, making her first appearance in Sandman #8. Death’s job entails meeting with the recently deceased and guiding them on their way into an afterlife, but she is also known to visit all new born, though only she ever retains memory of that initial encounter with a new life. DC Comic’s Death character is a world away from the popular image of the Grim Reaper, appearing as a young goth girl dressed in black, wearing a silver ankh and bearing a Horus style marking under her right eye. The series itself revolves around the female character of Didi, who claims she is the personification of Death itself, here on her one hundred year cycle to mix with humanity and gain insight into their lives and emotions. She meets a suicidal young man called Sexton, who is struggling to find reason in being, that is until he meets up with Didi/Death, she guides him on a journey of self realisation and discovery until eventually he gains a sense of self worth and an insight into his own mortality, and ultimately a love for living. Not your typical superhero style comic, which is no surprise considering its author, the high cost of living is a fantastic piece of comic book fiction with real heart and emotion, and takes you on a fascinating journey into the human psyche and presents you with a perky, fresh and fun version of Death, no pale riders here … just a pale goth who celebrates life. This cannot come more highly recommended, whether you read comic books or not this is an amazingly well written and beautifully put together story of life, love and loss and is also a great way to introduce yourself to one of this generations greatest writers … the inimitable Neil Gaiman.